Are you constantly striving to improve the quality of patient care? Are you conducting research in mental health pharmacy to support practice development? Have you been doing some great, innovative work? In addition, we are also offering a number of bursaries - for travel, research and education. 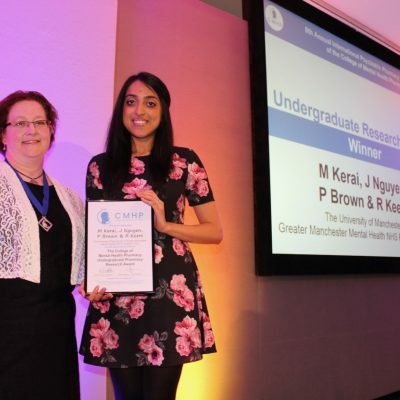 The prestigious the CMHP travel bursary for clinical or practice research in psychiatric pharmacy provides up to £1,500 sponsorship to attend a major international conference of the winner’s choice. The research bursary offers up to £5000 to support small projects which contribute to enhancing the quality of care with psychiatric medicines. The education bursary is allocated to support the education of pharmacists and technicians working in mental health. For details of how to apply for an award or bursary, please visit the Awards and Bursaries page which then links to further details for each category of award. · Education and travel bursary: Karen Shuker on education@cmhp.org.uk.